More and more people are gaining interest in gardening and homesteading. With this growth in home grown foods, a need for home-based food preservation methods naturally occurs. Storing food properly can extend a food supply for several months or longer. Home preservation methods can make this easy. Canning has been around for a long time as a method of food preservation. You can preserve food by using a boiling water bath or pressure canner. Either way, you'll be heating food to a specific temperature to kill food-spoiling bacteria. Heat forces air from the canning jar, and as it cools, the jar seals. 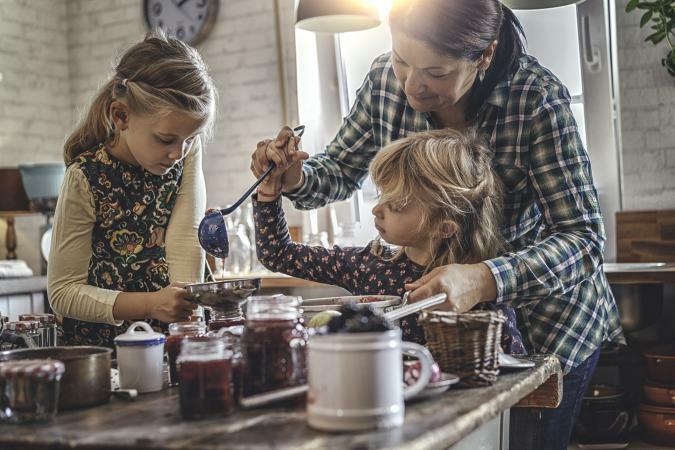 Common Sense Home lists canning is a top food preservation choice because bacteria can't seep into the jar, and food keeps for several years. The USDA recommends freezing for food preservation as it is much easier than canning. However, foods that are frozen can't be stored as long because freezing doesn't kill bacteria; it only renders it inactive. Additionally, enzyme activity in the food is slowed but still continues to degrade the food. Most foods can be stored for about three months to a year. Once food is thawed, bacteria will become active again. Freezing food requires freezer containers or bags manufactured for use in the freezer. The major drawback to freezing is that if the power goes out and your freezer stops, your food will spoil. Sun drying is an ancient method of food preservation. Sun drying is a way to dehydrate food using the sun and airflow and is best in 100 degree heat or more. SolarCooking.org recommends placing thinly sliced fruit on a well-ventilated surface and covering it with a cheesecloth to ward off insects. Sun drying takes several days to dry foods outside and can be impeded by unpredictable weather. You should bring drying fruits in for the night because cooler night air can slow the drying process. Smoking is one of the top methods of home food preservation for meats. The United States Department of Agriculture says it be done on a covered grill or in a smoker. To smoke on a grill, you'll need to place a pan of water in between piles of burning wood and position the meat over the pan to receive the smoke and steam. Using a variety of wood chips, such as hickory, apple, or maple, can add flavor. Smoked meat can last up to four days in the fridge or a few months in the freezer. Pickling is a traditional and common food preservation method, originally used in the days before refrigeration. Pickling uses salt, vinegar, or alcohol to preserve the food. However, it is important to follow recipes exactly because pickled foods are subject to spoilage from microorganisms. Pickled foods can last up to a year. 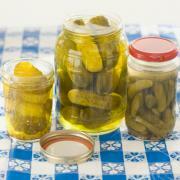 Oregon State University Extension has a fantastic step-by-step guide to pickling foods safely. Dehydrating is an excellent preservation tool, as it removes moisture from food and prevents spoilage. Dehydrated food doesn't lose its nutrients and is easy to store in an airtight container. Using a dehydrator is the easiest method, but dehydration can also be accomplished using a shallow pan in an oven at low temperatures - around 140 degrees. Dried food can last months to a year, depending on the temperature at which it is stored. The University of Missouri Extension offers practical, comprehensive information regarding dehydration for food preservation. Many people enjoy making jams and jellies to preserve food. This process works by using fruits high in pectin. Alternatively, people can use a commercially-manufactured pectin which comes in liquid or powered form, which speeds up the process. Sugar is also added to jams and jellies for the gel-like consistency and to act as a preservative. For consistent quality and uniformity in your jelly, it is important to follow step-by-step instructions. Homemade jam can last in the fridge for up to three weeks and can be frozen for six months. Food and Wine Magazine deemed using a root cellar one of the best methods of home food preservation. This type of preservation is for serious gardeners or homesteaders who need extra cold storage space for produce. A root cellar is built underground and is insulated and ventilated from the earth. They can range from a barrel to a whole room, but attention to the design and build are crucial to make a root cellar correctly. The average storage length is based on the vegetables stored, but may range from three to eight months. Salting to preserve food dates back thousands of years and is a favorite preservation method of Countryside Daily. Salt preserves food by pulling water from the food and inhibiting bacteria growth. When salting food, you should be generous and use a layer of salt about an inch thick. Once it is salted, you can hang the food to dry or add acid, such as vinegar, to pickle it. The self life of salted foods depends on the second step used to preserve the food, such as pickling.